The Chocolate Lab with Ball Figurine urn is available in four different sizes accomodating dogs up to about 100 pounds. The urn is made of quality solid hardwood available in Red Oak, Walnut, or Maple. 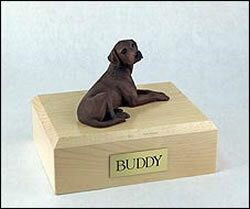 Each figurine is expertly crafted with amazing attention to every detail and professionaly finished giving you a unique and life-like pet urn. 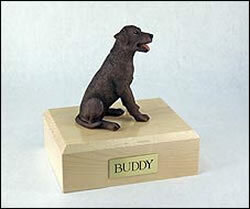 This particular chocolate lab figurine is extremely dark in color and may look black to many people. The sealed plastic bag of ashes is easily installed through a removable bottom which is secured with screws, providing tamper resistant protection. In some instances, the box containing the sealed plastic bag of cremains can be placed into the urn. 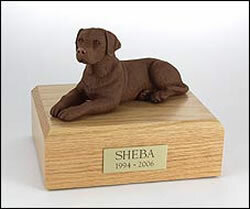 Your Chocolate Lab with Ball Figurine figurine urn is also available with engraving on a premium leaded brass nameplate of up to 100 characters on four lines giving you the opportunity to say almost anything.